We apologize if you're an actual giant who happened to stumble across this glove. First of all, we would like to say that we sympathize with you. It's probably extremely hard to find clothes to fit your giant-sized body (let alone a Halloween costume), but this isn't actually a wearable clawed Freddy Krueger glove. This is exclusively for those moments that pre-existing Giant Freddy Kruegers are clawing their way up from the depths of the underworld. Though, if you are a giant, at least that will be less frightening. We diminutive humans have to be terrified of the idea of the Springfield Slasher dragging us down there with him! 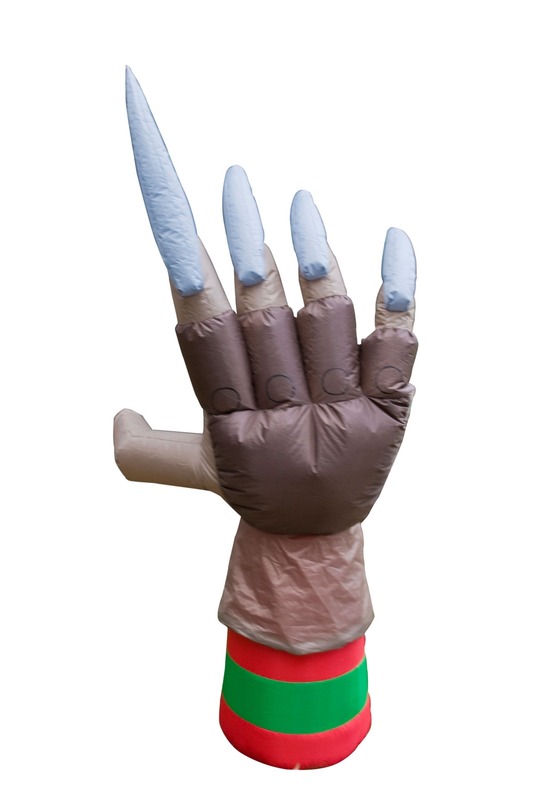 This Inflatable Freddy Glove from Nightmare on Elm Street measures in at a whopping 7-ft tall. Strings and tether stakes make it easy to tie the decoration down. Once it's plugged into an outlet, the glove glows and rotates because of the interior fan. It'll look like Freddy is ripping his way right out of... well... wherever he's dwelling currently. While we'd love to be able to provide deadly implements to a future generation of titanic horrors, that's still very much on the drawing board. The materials needed and sizing patterns for a 7" claw are just mind-boggling! But, until we can grant your giant-hearted dream, this Inflatable Freddy Glove will hopefully do.